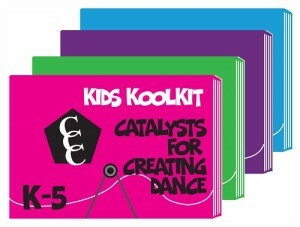 The Kids Koolkit 2 is a CONTEXTUAL LEARNING SYSTEMS™ kit with 235 resources devoted to the artistic process, CREATING. Materials align with the national core arts standards. Children broaden their movement and conceptual vocabulary simultaneously due to the mix of resources. The rich context built by these resources and activities enable a child to develop confidence when creating and the ability to effectively express unique ideas through movement. 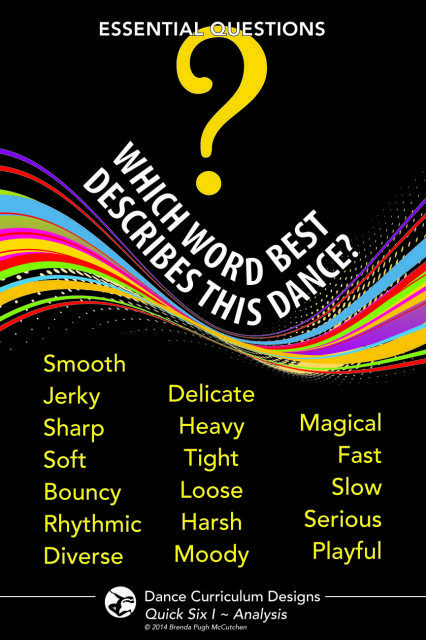 The elements of dance are essential to literacy in all aspects of dance (as a dancer, choreographer, critic, and historian). Each poster details the elements related to: 1) Body, 2) Space, 3) Time, 4) Energy, and 5) Relationship (BSTER). 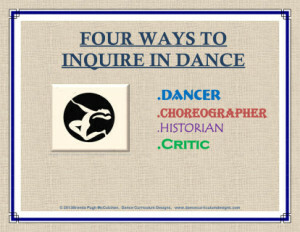 Content aligns with the “Elements of Dance” chart in Teaching Dance as Art in Education. Set 1 includes five super sized 24″ x 36″ color wall charts appropriate for K-12. It is a universal set for all ages. 1 color poster on sturdy cardstock, 19 x 13 inches. This poster is a work horse. 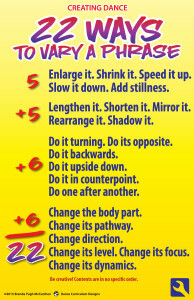 In easy-to-understand language this universal cue card specifies to all ages the manipulative devices (or tools) available when manipulating movement material. Essential Questions guide viewing and responding activities. 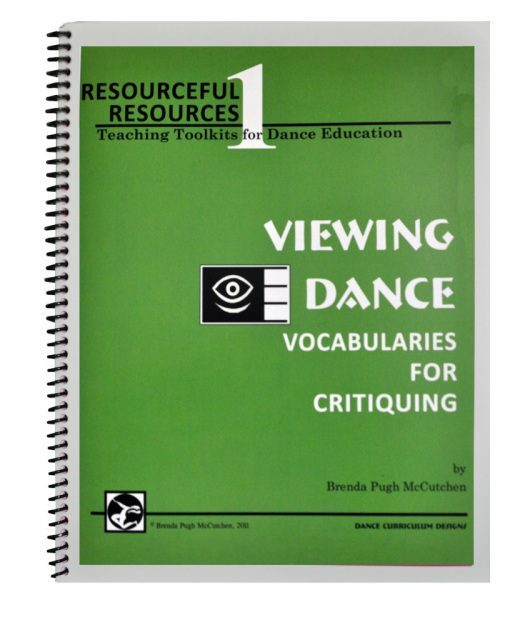 They focus on viewing to describe and analyze, use the elements of dance, and determine a dance’s emphasis. The set includes six 13″ x 19″ full-color posters. They are well-suited for all ages and ability levels (elementary, middle, high school, higher education, adult learners, and professional applications). Set 1 is the set to start with. Printed on sturdy semi-gloss card stock. This kit focuses on responding to dance so viewers gain tangible, analytical skills at upper elementary through adulthood. Four-Step Critique and Principles of Design posters lead users toward articulate reflection and analysis (and away from vague responses of the past). 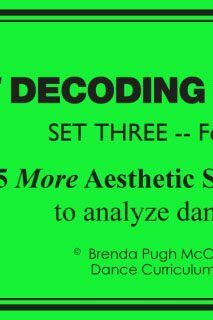 Viewer cards such as Decoding Dance Works and Critiquing Strips, guide viewing to ensure users don’t miss the elusive aspects of dance. Used over time, these resources drastically change the way viewers see dance. 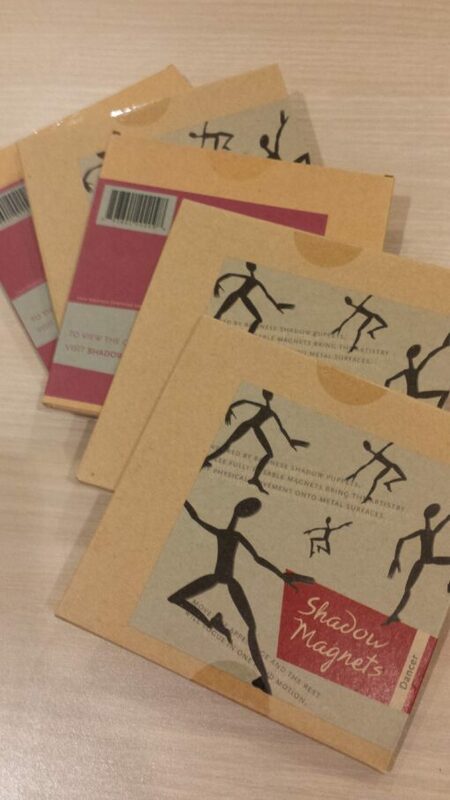 A useful Ideabook for teachers (pictured) comes with each kit. This set of posters examines dance from four vantage points: dancer, choreographer, critic, and historian. These perspectives develop each learner as a dance creator, performer, responder, and one who is able to connect dance meaningfully to other disciplines. 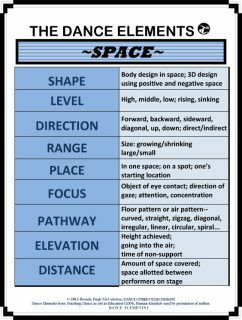 Use the poster set to introduce the lesson, pointing to which method(s) are to take center stage and which will be supporting methods each day. Set of 5 posters printed in color on 11″ x 17″ card stock. Suited to all ages over 8 in schools and studios. One of 5 shown. This bundle combines two strong “elements of dance” resources: Dance Elements Daisy (101 interactive creative problem-solving catalysts) and Dance Elements 1 wall charts. Both enable teachers to facilitate creative dance so learners embody the elements to become a functional language for dance. 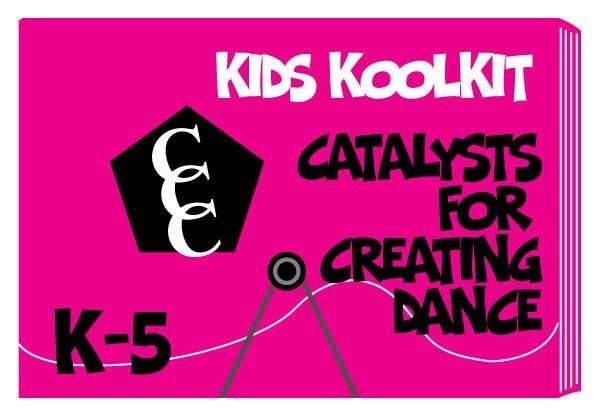 The creative catalyst (Dance Elements Daisy) with the anchor concepts (Dance Elements 1 wall charts) offer a strong context in which to create, perform, connect, and respond to dance with the elements. A 55-page Teacher’s Ideabook offers numerous ways to present and cross-reference the materials. 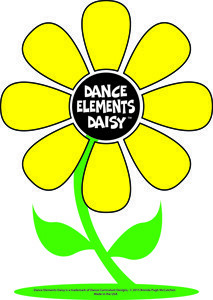 205 creative catalysts include “22 Ways to Vary a Phrase,” a set of “Flip Side” movement cards, the stanza booklet “Poetic Prompts to Choreograph,” and a bonus– the large 4 ft x 3 ft interactive “Dance Elements Daisy.” 30 teaching charts provide the enduring understanding that supports quality dance-making and the NCAS standards: “The Process for Dance-Making” (7), “Tools To Use for Dance-Making” (15), “Beginning-Middle-End” (2), and “Foundation Structures” (6). They are the worker bees while the creative catalysts are the queen bees. Plus Dance Elements Set 1. Actively learn anatomy! 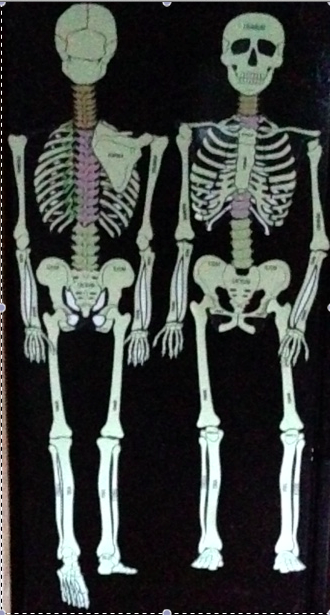 Construct your own skeleton with life-sized magnetic bones. Enjoy building the human structure one bone at a time; challenge students with skeleton-building relays; and play “Ouch Bone,” an activity in which students identify the misplaced bone! Introduce bone magnets to your students to aid their understanding of the body’s structural landmarks. DEGAS DANCER is a 12-inch magnet with hinged joints that bring her to life. Her mobility enables her to demonstrate proper alignment, flexion and extension, and much more. 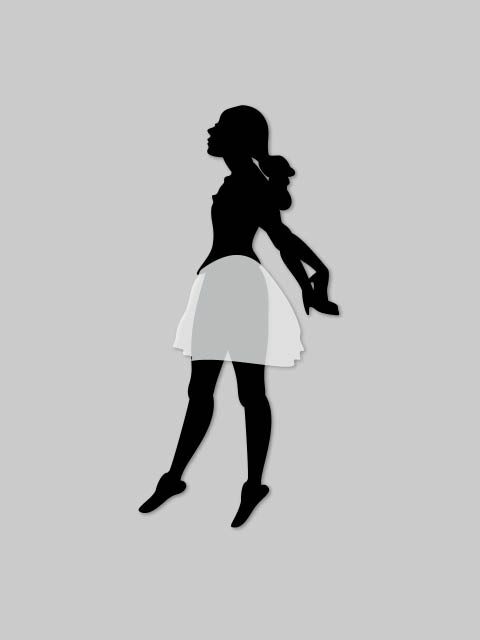 The magnet, like the art work that inspired it, features a ballet skirt to add movement interest to the figure and her choreography. Magnet designed by Rami Geller. 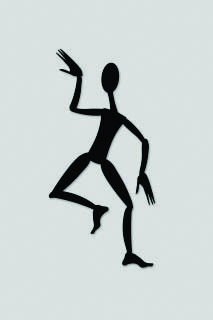 The 12-inch moveable DANCER magnet easily repositions into intriguing shapes and images with the touch of a finger. This fun, hinged magnet helps you instruct your students regarding proper posture, dance positions, stage direction and more. Magnet designed by Rami Geller. 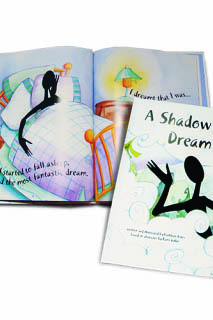 This children’s book takes the child on an imaginative journey with the DANCER. What does DANCER dream about when he goes to sleep? Go inside the mind of a Shadow puppet and move with him as DANCER becomes a raven, a fish, an elephant and other fantastic creatures. Geared for early childhood imagination and creativity. DANCER Magnet by Rami Geller, included. Want enough magnets to energize group work? Get five! One magnet per group provides the catalyst for creative and collaborative problem-solving. Possibilities are endless, so here are some starter suggestions. Want a mix? This stack has 3 DANCER and 2 DEGAS DANCER magnets. Save with a stack.